Think about it: Would an earlier generation of editors like Walter Cronkite do something like this? Views on what is news, and what might attract new or young readers, are shifting. Writing for the Poynter Institute, James Warren, a long-time political observer, said the mock page fell flat. Would an earlier generation of editors like Walter Cronkite do something like this? Political satire is not easy. Even “Saturday Night Live” had pratfalls, sometimes whole seasons of them. It might be argued that what the Globe did was a blunt political statement. They included the Indianapolis Star, the New York Times and the Las Vegas Review-Journal. Few ran satirical or unorthodox front pages, he said, except for USA Today, which published a commemorative edition. Mullin added that the Boston Globe is not the first news organization to imagine a Trump victory. The Atlantic published an article examining a “fictional and disastrous term” for Trump, he said. Politico reported that Trump blasted the fake page, but noted such a page was “a new thing in this campaign,” while Trump’s tirades against media organizations were common. 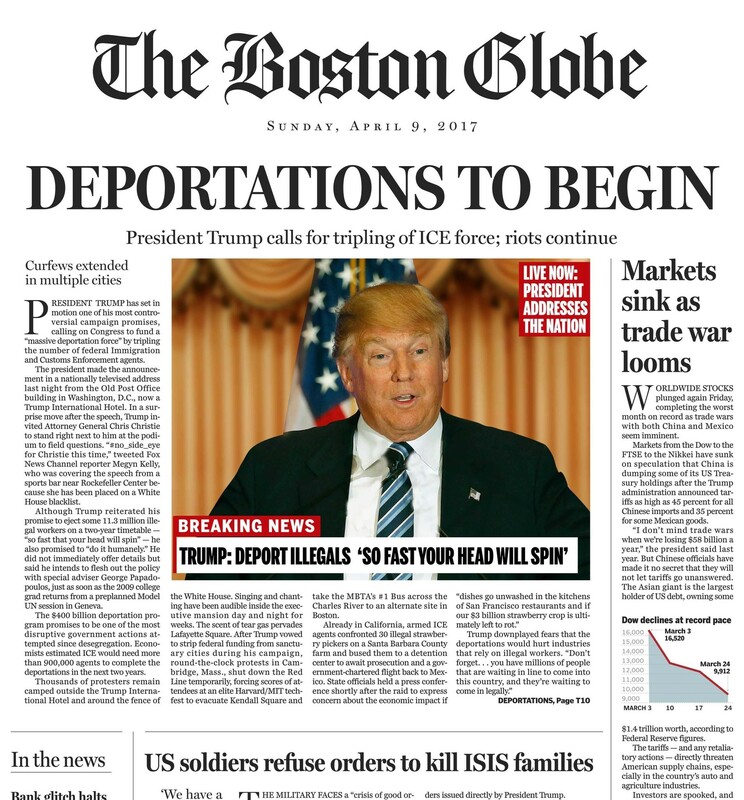 Overall, the assessments appear to conclude that the Boston Globe’s satirical dig at Trump was a miss, not a hit. Interesting, maybe, but not especially successful. Something for those trying to remake journalism by using humor and frivolity to keep in mind. Effective political satire, put-downs, tend to aim for the jugular. You have to ask yourself if a newspaper with an illustrious history, including 23 Pulitzer prizes, is the proper vehicle for that. Sure, journalism is changing. But objectivity, ethics and fairness are still hallmarks of the most prestigious and respected journalists and media.